Schnauz - thanoscardgamess jimdo page! 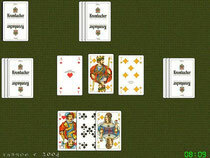 Schnauz is a card game in which you improve your hand by exchanging cards with a central pool of face-up cards. Other names for the game are 31, Schwimmen, Knack and Hosen 'runter (trousers down). Although it is known in many parts of the world, it seems to be particularly popular in Germany and the western part of Austria. At your turn you are allowed to exchange one card of your hand with one of the face up cards on the table. If you do not want to exchange a card you are allowed to pass instead. The turn then passes to the next player. You may play it with French suited or German suited card decks.